I’ve spent the past couple days housesitting for a friend. It was an odd experience as there was no internet access. I now understand what the pioneers went through. I spent most of the time working playing the banjo and watching tv shows like Modern Famly and The Big Bang Theory on DVD. The solitude was quite enjoyable. My last post on The Isle of Lewis got a lot of responses and questions as to why I am so interested in Standing Stones, Stone Circles, and Dolmen. The simple answer is I am in awe of their permanence. My family settled in Sheffield Village, Ohio in 1846 and during my genealogy research I found a map of the area from 1870. It showed a series of Indian Mounds all along the Black River and also along the French Creek. Then I found another map from 1920 and they were all gone. What a shame. The standing stones in The Hebrides along with the others all through Britain, Wales, Ireland, France and Italy have stood for thousands of years. Roman armies have marched past them. Why do they respect their history while we disrespect ours? 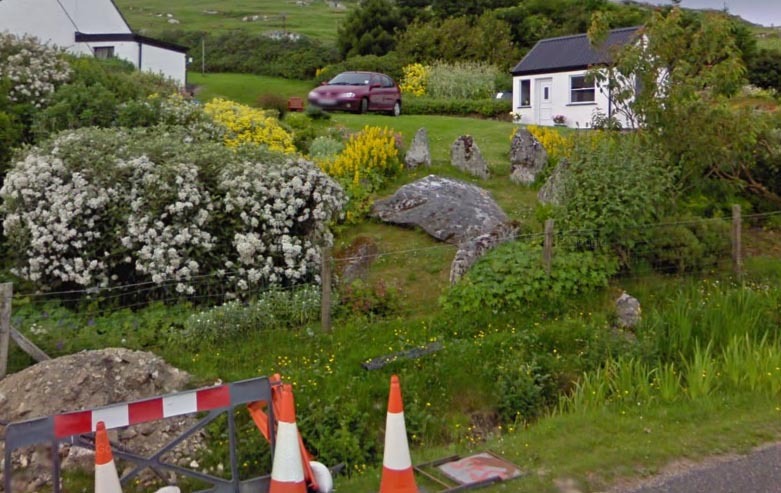 Anyway, now that I have time to renew my interest in Megaliths I’ve been having fun with Google Maps with Street View. With Street View you can walk down the street almost anywhere in the world and look around. I decided to take it for a spin on the Outer Hebrides. I started with the Isle of Lewis, then went to Harris and eventually to Barra. Walking through Lewis I was able to approach Callanish and get a pretty good look. Here is what I saw, Click on the pictures to enlarge. Most of the stones and circles are frustratingly off the road so all you can see are glimpses but some are incredible fun like finding Coire Na Feinne in someones’ front yard. To see a much better picture of Coire Na Feinne look here. I spent a lot of time playing online poker and while doing that I walk around the islands looking for Megaliths. I will post more as I find them. 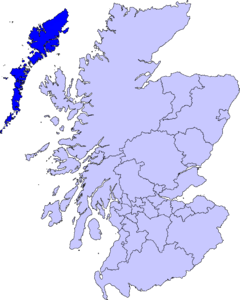 When I retire I want to go to the Isle of Lewis in the Outer Hebrides. All my life I have been fascinated by Megaliths. I’ve read every book and researched every website I can find on standing stones, stone circles and dolmen. The Isle of Lewis has The Callanish Stones. It is hard to pinpoint when the site was constructed but I’ve read anywhere from 1800 -2600 BC. Here is a great picture I found on Flickr by someone calling himself Randomdam. Here is another one showing scale. It is from someone called The Ewan. 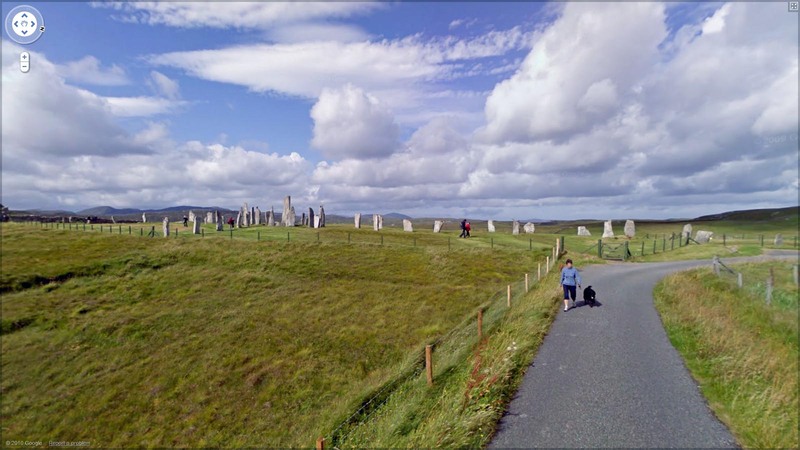 There are many megalithic sites in the area and you can read about the Callanish Stones here. The other day I was reading a banjo blog and came across a twenty-minute video of some guys bicycling through the Outer Hebrides. The video is titled, The Outer Hebridean Ice Cream Adventure. The video is a lot of fun as they are cycling, playing the banjo and making ice cream along the way. Around the 14:30 mark they enter Carlabhagh and proceed to make ice cream in the middle of The Callanish Stones. This video is a real treat. If you watch the video be sure and go to their website and read about the adventure. I must go to Scotland and see this. I have friends who can’t imagine retiring. They say, “What will you do with your time?” Watch the video.